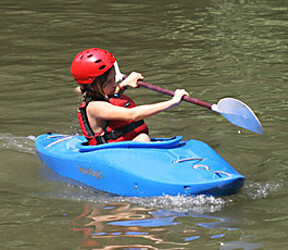 As an outdoors summer camp, Rockbrook offers its campers a huge range of activities outdoors. There are short day hikes and longer overnight backpacking trips, whitewater kayaking and canoeing trips, and climbing days outside. 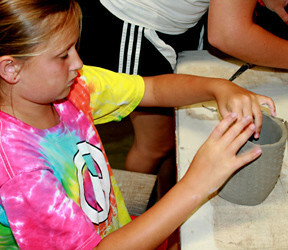 The general activities at Rockbrook add to its outdoor camp character. 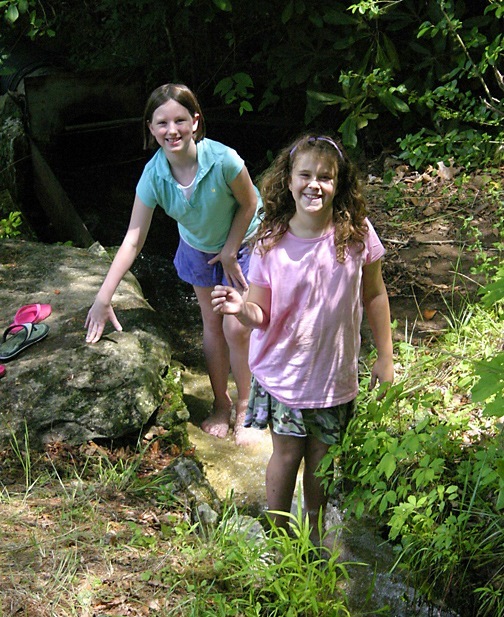 The open air cabins, wooded setting, daily swimming and hiking, and historic cabins and lodges make for a true childhood outdoor experience. Backpacking and camping have been an almost nightly trip this week. Michelle our fabulous hiking guide, who is a Wilderness First Aid Responder and who has been a Rockbrook girl for thirteen years (she started at 7 years old), has been leading these trips. 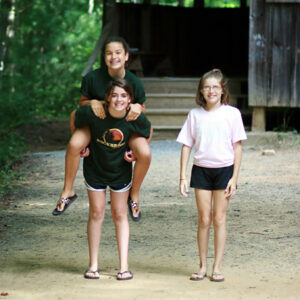 She’s been taking our Juniors in cabin groups, 2 at a time, out to the outpost campsite here on the camp property. After a short hike through the woods towards Rockbrook Falls, there’s a small trail that leads to a clearing below Dunn’s Rock where we have two tent platforms and a fire ring. 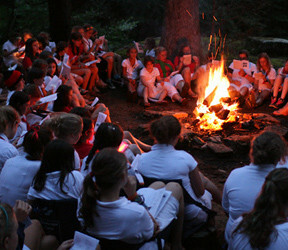 The girls have a campfire, sing songs, tell stories, and enjoy making s’mores. All the girls from each Junior cabin plus their counselors go on these trips, and when it’s time for bed, everyone sleeps together, “slumber party style,” on the platforms. Out in the woods, armed with their flashlights against the sounds of the night and filled with nervous excitement, it can take a while for everyone to fall asleep. But that’s part of the fun! 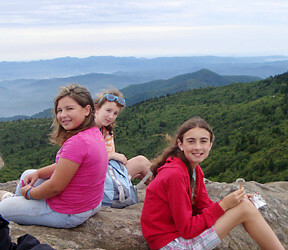 Michelle also took a Middler backpacking trip out into Pisgah Thursday night. With their tents, sleeping bags and food (s’mores again!) stuffed into backpacks, they hiked about 2 miles into the forest to one of our secret campsites. These trips are great opportunities to get to know each other. Telling stories around the campfire and just sharing the experience overall, the whole group grows closer. 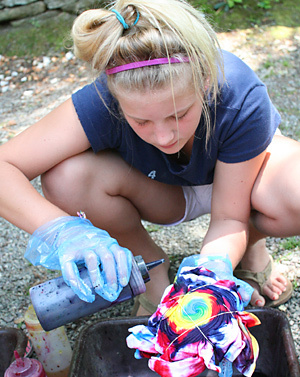 This has also been a week of tie dying in the “Hodge Podge” activity. 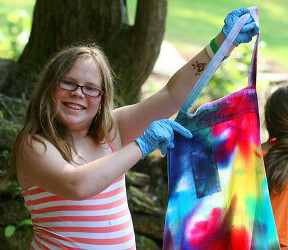 There’s a lot of variety here as each camper twists and folds her shirt in a unique pattern and then adds different color dyes. After letting them rest over night, it’s exciting to untie the shirts and see how they turned out— vibrant spirals, bullseyes and stripes. In the photography activity, Jane has been teaching the campers about stop motion techniques. 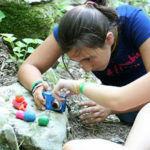 Working in groups of 2 or 3 campers, and using Play-Doh, the girls animated short sequences of photos which when strung together create motion videos. This takes not only creativity, but real planning, a steady camera, and plenty of patience to accomplish. A group of girls went rock climbing today with Maddie and were lucky to set up 3 different routes on Looking Glass Rock out in Pisgah. Again, excellent weather, dry and clear, made the equally excellent rock even more enjoyable for everyone. A packed lunch, complete with muffins, went along to keep up their energy, and when you check out the photo gallery, you’ll see just how well and how high these girls climbed. There are some amazing rock climbing girls around here. Back at camp, everyone else got to dig into some of Rick’s homemade chili complete with all the fixin’s: diced tomatoes, cheese, sour cream, Frito’s corn chips, and our super stocked salad bars. There was some debate about whether the vegetarian or the meat version was better, but that was never really settled! After dinner during the “Twilight” block of free time, a couple of counselors organized an open tetherball tournament for anyone interested in playing. It was the “triple T” (Twilight Tetherball Tournament). Should we add “terrific” in there? 🙂 Paired up by age group, the girls took turns playing each other as the rest of the crowd cheered them on. Quite strategically, the counselors chose players to make sure that the brackets kept everyone involved, not so much to determine who “won,” but to see the girls enjoying the games. With the late evening sun setting across the valley, it was a beautiful summertime moment. Even better, most of this action happens outside. 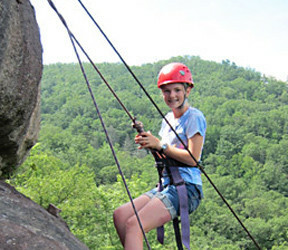 So in addition to the simple physical benefits of being active, campers also find themselves being more relaxed, more perceptive, and even more caring. The research supporting the positive effects of outdoor experience for children is strong and convincing. Now there is a national campaign that recognizes and supports most of this. Launched by First Lady Michelle Obama, this initiative, titled “Let’s Move!“, is dedicated to solving the problem of childhood obesity in America by encouraging common sense strategies and providing important information to improve child nutrition and physical activity. Our kids need to eat healthier food and to be more active if we are to address this growing problem. 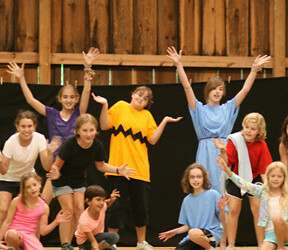 Camp can easily be seen as a model for the Let’s Move! initiative. After all, outdoor activity is the name of the game around here at Rockbrook, but also, we proudly serve excellent, nutritious meals, using local produce when we can, avoiding trans-fats, and making most things from scratch. If you haven’t seen our Taste of Rockbrook video, check it out and see what I mean. As we, and the Let’s Move! 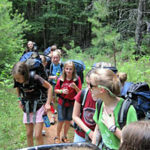 initiative, advocate for a more healthy, active, balanced life for children, let’s get our kids outside this summer, and let’s get them to camp! Mallory, our head climbing instructor, is doing a fabulous job inspiring the girls to sign up for the rock climbing trips she’s planned all week long. 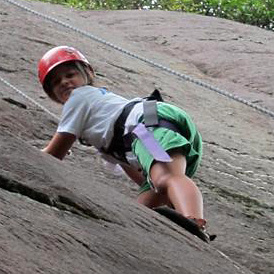 Everyday girls are climbing at Rockbrook. They’re on the climbing wall in the gym, all over the Alpine Tower (something super popular, even with the littlest Juniors), and up on Castle Rock. If you’ve studied the map of Rockbrook, you’d have spotted the two huge outcroppings of granite on the camp property, Castle Rock and Dunn’s Rock. 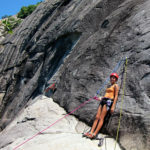 While Dunn’s is larger and a known Peregrine Falcon nesting area, Castle Rock is perfectly suited for rock climbing. We’ve developed six excellent climbing routes ranging from a beginning grade through a cool, more challenging (and really high!) route up the face of the rock. The shortest route is about 25 feet, but the longest is over 100 feet long! Rockbrook is very fortunate to have this caliber of rock climbing right in camp, literally in our own backyard. 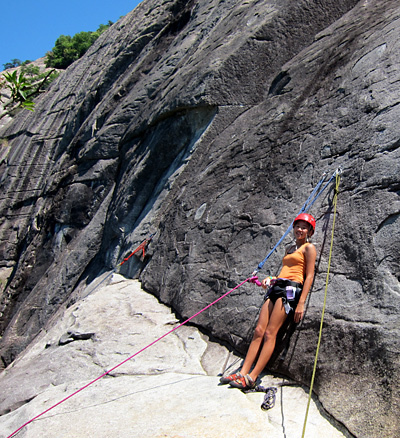 It makes it very easy for us to go rock climbing a lot. 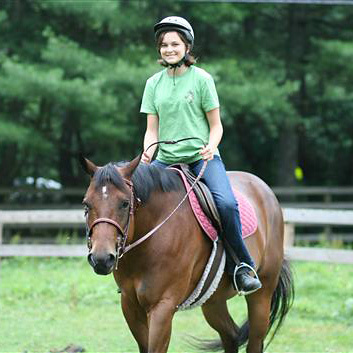 Another activity that remains one of the most popular at camp is horseback riding. That’s probably not too surprising, but it seems like we’re seeing lots of excitement down at the barn these days. The equestrian instructors are teaching between 8 and 12 mounted lessons a day, and the stable club is meeting twice daily. 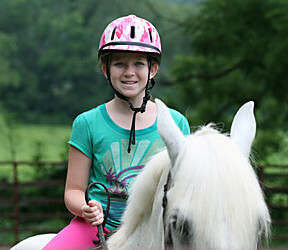 The stable club is an extra activity time when girls can stay and help take care of the horses—bathing, brushing and even trimming them. With all that attention and so many girls working closely with the horses, petting them and talking to them, it’s no surprise that we have very attractive horses at Rockbrook, sometimes with braids in their manes or tails, but always clean and shiny. Certain favorite horses are so pampered! What’s more fun the playing bingo with your friends? Playing bingo for fabulous prizes? Yes. 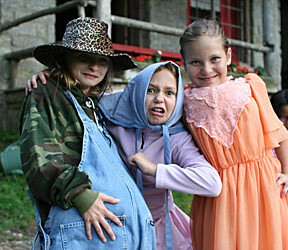 But even more so, playing bingo dressed up as a granny or a grandpa! That was our evening program tonight: a classic event we call “Granny Bingo.” Dressing up for this event involves wigs, glasses, strategically placed pillows in clothes, bathrobes, walking sticks and powder in your hair. Add to that a scratchy, thin voice and you can have a pretty convincing character. The counselors dress up as well and perform while calling the numbers. “B29… oh deary, how I’d like to be 29 again!” “Turn up your hearing aid girlies, and let’s play bingo!” It’s really funny stuff to look around and see the dining hall filled with old ladies and men carefully matching their numbers. It didn’t take long to hear “BINGO” and excited cheers when someone from a cabin filled a row. Feel free to retweet these posts and share them with your friends on facebook. Or, just leave a comment! 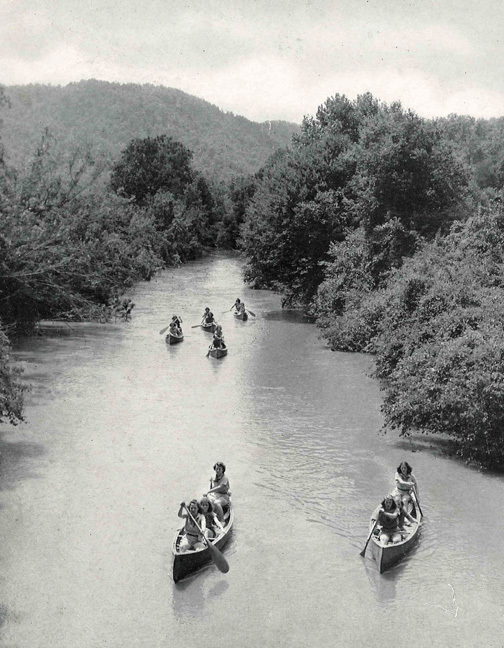 A girl who attended Rockbrook in the 1920s recalls the multi-day canoeing adventure on the French Broad River. “When I had done nothing less than run up the hill twice and play off a tennis match, I suddenly remembered I was going on an all-day canoe trip. I dashed madly down the hill again to the landing and found I had not been left, after all. Mrs. Carrier was to go with us, which made the trip simply grand. Only three canoes went, and the trip was a roar of laughter from beginning to end. Mrs. Barron and Miss Neely had never been down, so there were many new things for them to see. We amused ourselves childishly all morning by jumping up and down in the bow and making waves. We had lunch at French Broad Landing, and my! how good everything was, from steak to caramel cake. That’s what comes of having Miss Neely along. Much to our sorrow, Mrs. Carrier had to leave us, but Doe came. We changed canoes after lunch, and Miss Neely was with Jane and me. We started the afternoon pleasantly by accidentally splashing some water on the next canoe, and then the fun began. Miss Neely tried vainly to shelter herself under a raincoat, but finally had to succumb to Jerky’s pleas to get in her canoe. Jo came in ours, and poor Doe had no-where to go. Jerky’s canoe, seeing themselves in danger, paddled ahead, and Miss Neely paddled for the first time in her life. A series of water fights ensued, and Jerky called back to us not to swallow any water, but I was beyond that stage. I talk so much that my mouth stayed open, and as I could not habitually think and splash at the same time, I consequently nearly choked. —Mimi O’Beirne. July 30, 1927. In the recent debate over how many days kids should stay in school, it’s often claimed that they could learn more by shortening the summer vacation. More days studying math, science, arts and reading would make our kids more educated, it’s claimed. Certainly this is true; the more you study something, the better your competency in that subject. However, what is lost by taking time from summer and devoting it to further study? If we choose more school time, what are we neglecting as a result? 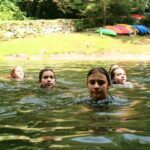 One thing that would clearly suffer, and something that summer camps are known to enhance, is time outside, sustained outdoor activity for kids. It’s during the summer that kids have the time and the permission to play outside. They can return to nature, explore all the amazing details of the environment, and really feel what so many of their ancestors felt outdoors. Being inside at school most of day, and for most of the days each year, there are very few opportunities for kids to enjoy outdoor activity. They suffer from what Richard Louv has now famously dubbed “Nature Deficit Disorder.” The psychological, personal and intellectual consequences of our kids losing touch of nature are now well understood, and are widely condemned. Extending our kid’s school year, and thereby further limiting their time outside in Nature deserves that same condemnation. This is also an environmental protection issue. If we reduce the ability of our kids to experience and know the outdoors, we make it much less likely they will value and love it. 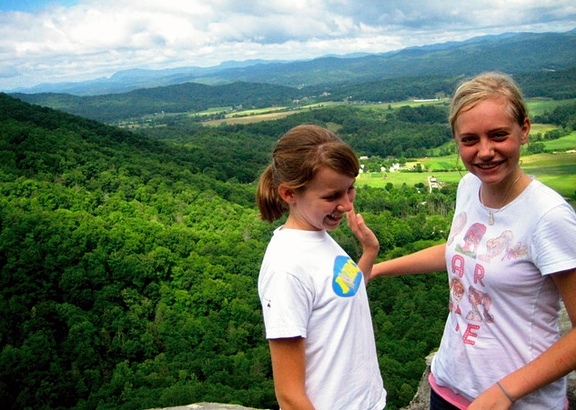 If their Nature Deficit Disorder is made worse by reducing their time outside of school, they won’t feel strongly about the wonders Nature provides, and consequently they will feel less concern for protecting the environment. Not knowing and loving nature from their personal experience, they’ll be less apt to protect it. Here again, time outside (and away from school) makes kids more human. It provides another, equally important, form of education. Denying them opportunities to learn outside, even when in service of traditional academic learning, is a perilous position for us all. 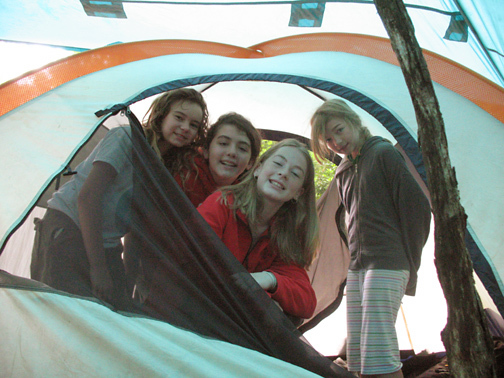 Outdoors activities, like overnight camping, are one of the things children really look forward to at camp. Getting together with friends, hiking into the woods, setting up a campsite, having dinner around a campfire, making s’mores, and sleeping in a tent are all so much fun. Just being outdoors like this is so different that ordinary life, children really enjoy it. Gosh, just playing with your flashlight in the tent can be a thrill, and think of the shadow puppets you can make! All of this in addition to the benefits of genuine outdoor experience— no wonder children like it. 3. Play in a safe place. 4. Camp under the stars. 7. Play on a team. 10. Celebrate his or her heritage. The connections here to summer camp, of course, are strong. After all, it’s what camp does every day— we splash, play, climb, camp out, explore and discover, celebrate and learn… all in the context of being outside. 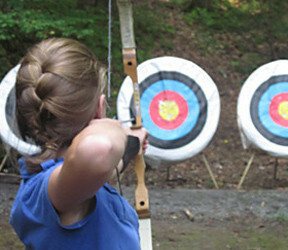 It would be great to see some of this implemented in schools, but at the very least, we know that camp is a great start. 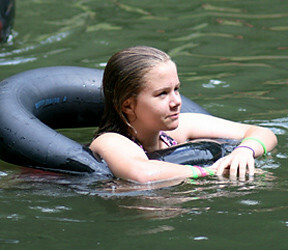 Sliding Rock Outdoor Camp Fun! 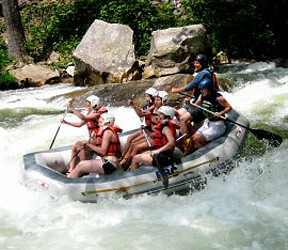 Another amazing trip we take while at camp is to Sliding Rock in the Pisgah Forest. 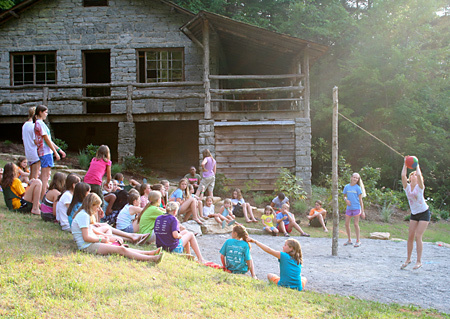 Only a few miles from camp, we’ll take a whole group of girls over for a few trips down the natural water slide. It’s tons of fun! You walk to the top of the slide, sit down in the very chilly rushing stream water, and you’re off… heading right down to the deep pool at the bottom the the slide. Swim to the side and then head back to the top! Over and over again, it’s great. There’s really nothing more classic than this kind of mountain summer fun. 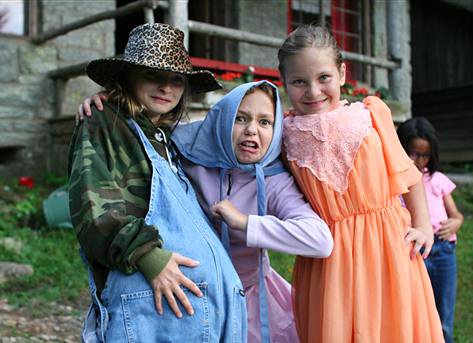 And speaking of relay races… here’s another classic summer camp activity. It’s the greased watermelon! There are several versions of this, but basically you take a good sized watermelon, coat it with shortening, toss it in the water (yep, it floats) and then you try to push it through the water as a relay. You can also set up two teams and play a little “soccer” with two goals. Lots of outdoor summer action in the cool water of the lake.